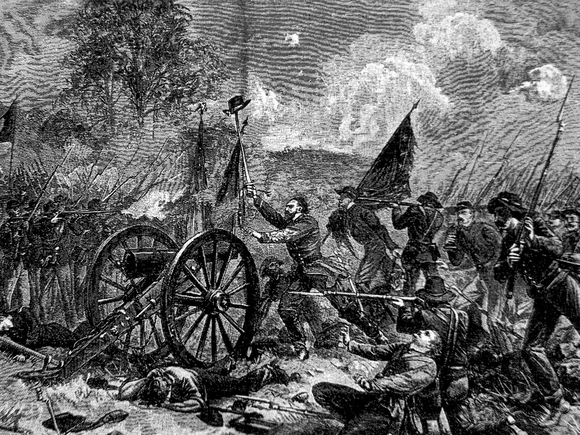 Directly following the Battle of Antietam, the Confederate Army was successful in several battles including Fredericksburg and Chancellorsville. The continuous series of battles had drained the South of irreplaceable resources. They were largely irreplaceable as a result of President Lincoln's Anaconda Plan. The Plan blockaded Confederate ports, keeping them from receiving badly needed supplies including arms and ammunition. Once more President Jefferson Davis turned to General Robert E. Lee for advice and leadership. Davis and Lee decided to again send the Army of North Virginia northward to search the factories and countryside of Maryland and Pennsylvania for badly needed supplies. Lee hoped that a victory would move the European nations to support their cause. Then, in June of 1863, Lee crossed the Potomac River and entered southern Pennsylvania. He directed the Army of Northern Virginia on a path to the rail center In Harrisburg. As soon as President Lincoln heard about Lee's movement northward he promoted his fifth commander of the Army of the Potomac in 10 months, General George Meade. Meade quickly assumed command and wasted no time as he set out to intercept General Lee and his forces. The two sides would meet unexpectedly when General A.P. Hill and his men were searching for a shoe factory in Gettysburg. At the time, Hill's men were in desperately in need of shoes. Both sides clashed on July 1 when a Union cavalry patrol came upon the advancing Confederate rebels. The Confederates were badly outnumbered but they held their own until General Ewell and additional troops arrived. Ewell and his men pushed the Union soldiers back onto the high ground of Cemetery Ridge and Culp's Hill. There they dug in along a 4 mile front. Before long the rebel forces were joined by General Robert E. Lee and his men. All afternoon long units from both sides poured into Gettysburg, but unfortunately for Lee his cavalry commander J.E.B. Stuart had gone off on a raid and there was no way to communicate with him. On July 2, Meade had his 90,000 men arranged in a fish hook pattern that stretched around Culp's Hill in the north and three miles southward along Cemetery Ridge to Little Round Top. At the same time, General Lee and his forces were just 3/4ths of a mile to the west on the high ground of Seminary Ridge. The Confederate rebels attacked the Union on the left and right sides. Then after close horrific battles the Union troops forced them to withdraw. Having failed in attacks on both sides General Lee decided to attack Meade's army directly in the center. General George Pickett led 15,000 men against the Union forces in what would forever be known as “Pickett's Charge.” Pickett started his advance at 3 o'clock in the afternoon, and for the next three-quarters of a mile approximately 200 Union guns tore them to shreds. Simultaneously, the Union soldiers showered them with musket fire. Amazingly, despite the constant bombardment the Confederate forces broke through the Union line before they were repelled by reinforcements in what would become known as “the high tide of the Confederacy.” Only half of Pickett's men made it back to Seminary Ridge. After three days of vicious fighting, both sides had lost about 23,000 men. Lee had expected General Meade to fight on a fourth day, but Meade was satisfied with the outcome. Then as Lee and his men retreated to Virginia, Meade and his troops did not follow. Fighting would continue for the next two years, but things would never be the same for them after Gettysburg.